Nice post! What’s your opinion on EVPN vs PBB-EVPN. Without PBB there could be scalability concerns depending on the number of MAC addresses. What I’ve noticed from the Cisco implementation is that it’s a bit tricky to troubleshoot it but that may be because we’re not very used to the protocol yet. My opinion is that I don’t see the use case for PBB-EVPN. The whole goal of EVPN is to have that control-plane for Layer 2 traffic and make intelligent forwarding decisions based on the MAC entries in the routing/forwarding table. With PBB you abstract that away. Scalability shouldn’t be an issue on today’s platforms anymore. We can scale easily to hundreds of thousands of MAC addresses and IP routes and keep the protocol still converging fast (look at the Internet Routing table). Good write up explaining the benefits! Did you use PBB-EVPN or EVPN-MPLS in your lab testing? Just wondering if cisco have implemented RFC 7432 (EVPN-MPLS)? As far as I know Cisco has not implemented RFC7432, which still amazes me, as I’d be using that for any DCI deployment. Though the question remains when we may finaly see support for PBB-EVPN on MX platform. As with pure EVPN we are back in Y2k where we had to scale FIB by adding more PEs to the POP and creating separate RR planes to scale the control plane. I can’t comment on features that may come in the MX platform, but FIB scaling is definitely not an issue. 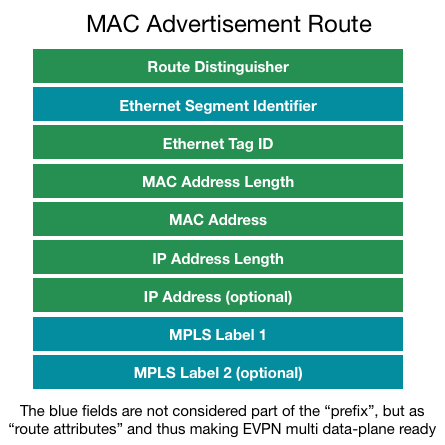 The MX can store millions of FIB routing entries as well as a million MAC addresses. As for (virtual) route reflectors, these scale today to tens of millions of entries in RIB. Please consult your local Juniper resource regarding PBB-EVPN support on MX. It was really helpful!! thnx for the write-up. We have two Data-Centers connected with 2*10G Dark Fiber, there is an application which is dependent of Layer2 so we have to extend our layer2 across data center but we are facing issues in layer2 like STP and Arp-Flooding. Edge devices are HP FlexFabric Switches, Can we use EVPN and limit these layer2 issues and also get advantage of Layer2 for application to work. EVPN would be a good technology to use in your use case and would be an open standards approach to your problem. As far as I can see the HP Flexfabric switches only support EVPN/VXLAN which uses ARP Flooding to ensure reachability. EVPN/MPLS would be a better solution which is typically deployed on separate devices in the data center. I would recommend Juniper MX or Juniper EX9200 series. Have Avaya SPB used in our network and we have brought 2 7k’s for our core data center switches. We want to have active active DC’s We have dark fiber for our DCI. Will EVPN work for us? Very good post, thanks a lot! And I wish you all the best!